Here is what we think are the Top 5 Authentication AngularJS Modules. 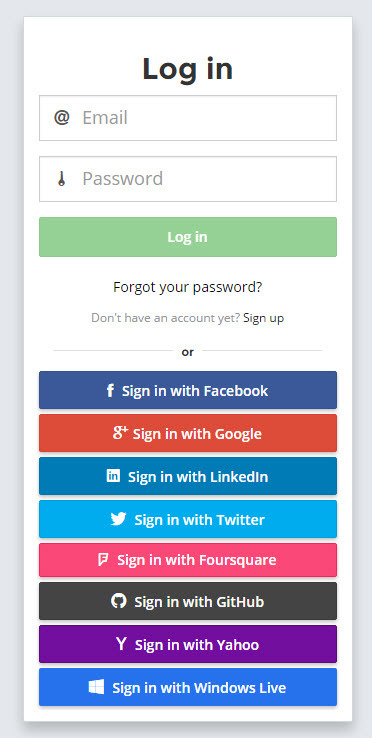 Everyone hates “logging in” using username and password so why not offer your app users a one-click login!? Some decent AngularJS options are Satellizer which provide just that with a ridiculous number of social network authentications available including Facebook, Google, LinkedIn, Twitter, FourSquare, GitHub, Yahoo, Windows Live and more. Satellizer also has a really good AngularJS Authentication example to get you started. Other modules worth looking at mainly involve AngularJS token based Authentication. One way to implement authentication/authorization in Angular applications. Simple, secure authentication for AngularJS. Tutorial shows Authentication in AngularJS with ASP.NET Web API 2 and Owin Middle-ware using access tokens and refresh tokens approach. Thank you for reading and if you would like to you can submit your Authentication AngularJS Modules or leave a comment below. Post tags: Authentication, authorization, oauth 2.0, oauth 1.0, google auth, oauth, auth, angular authentication, ngAuth, token authentication, token based authentication, authorize. is above plugin will work without backend or we need backend?